The 5 years of free Limo Anywhere software (the “Prize”) will be awarded to the 5000th user that signs up for Limo Anywhere (the “New User”). If the New User is referred by an existing user, the Prize will be awarded also to the existing user that referred the New User first (the “Referrer”). Upon sign-up, in order to be awarded the Prize, the New User must pay the full Limo Anywhere upfront fee ($299.00). In order to be awarded the Prize, the Referrer – where applicable – must be in good standing with Limo Anywhere. The 5 years shall be deemed 5 calendar years accruing (for both the New User, and – where applicable – the Referrer) from the sign-up date of the New User. In order to be awarded the Prize, the New User must begin using the Limo Anywhere software within 90 days from the sign-up date, either for at least 1 ride per month, or by logging in at least every 90 days. If, at any time after the first use, the New User (i) cancels its subscription, or (ii) uses the Limo Anywhere software either for fewer than 1 ride per month, or by logging in less frequently than every 90 days, the New User’s Prize will be voided. If, at any time after the New User’s sign-up, the Referrer (where applicable) (i) cancels its subscription, or (ii) uses the Limo Anywhere software either for fewer than 1 ride per month, or by logging in less frequently than every 90 days, the Referrer’s Prize will be voided. The Prize includes Limo Anywhere’s core software. The Prize does not include mobile responsive website, custom-branded passenger app, or any extra add-on modules (such as – and not limited to – International Text Messaging, Company Alias, Groundspan, Transponet, API access). Only US business entities are eligible for this promotion. Limo Anywhere partners (including their respective parents, subsidiaries, affiliates, sweepstakes and advertising agencies) are not eligible for this promotion. In order to be eligible for this promotion, a new user must sign up by phone with a sales representative. 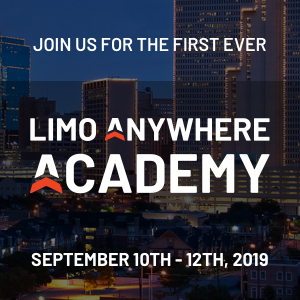 This promotion is valid from September 19th, 2018 at 12:00 AM EST until the New User has signed up for Limo Anywhere. This promotion is valid only for 1 new user and – only in case such new user is referred – 1 (the first) referrer. The overall value of the Prize (or of the combination of the New User’s Prize and Referrer’s Prize, if applicable) cannot exceed $30,000. This promotion is subject to all applicable federal, state, and local laws. Third party terms and conditions may apply to any part of this promotion where applicable. Limo Anywhere reserves the right to immediately terminate or change all or any of these terms at any time for any reason, without prior notice.